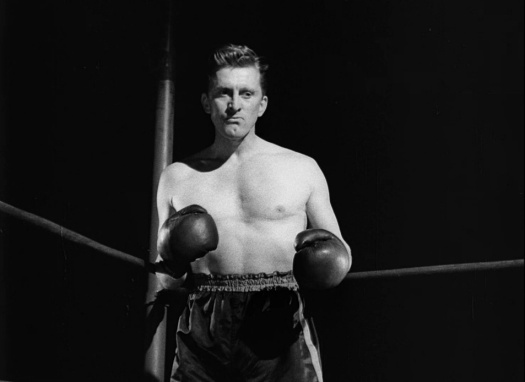 Kirk Douglas slugged his way to superstardom in director Mark Robson’s CHAMPION, one of two boxing noirs made in 1949. The other was THE SET-UP , helmed by Robson’s former RKO/Val Lewton stablemate Robert Wise. 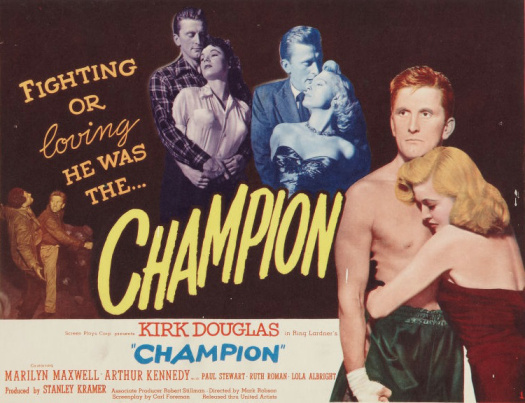 While that film told of an aging boxer (Robert Ryan) on the way down, CHAMPION is the story of a hungry young fighter who lets nothing stand in his way to the top of the food chain. The movie not only put Douglas on the map, it was a breakthrough for its young independent producer Stanley Kramer . Stanley Kramer is one of those old school filmmakers who directed several films that were acclaimed when they were originally released but who tends to be dismissed by contemporary film critics. Kramer specialized in making films about social issues and he deserves to be applauded for attempting to look at issues that Hollywood, at that time, would have preferred to ignore. However, as Mark Harris points out in his excellent book Pictures At A Revolution, Kramer started out as a producer and, even after he started directing, he never lost his producer sensibility. As a result, a Kramer film would typically address issues that were guaranteed to generate a lot of free publicity but, at the same time, Kramer would never run the risk of truly alienating his audience by digging too deeply into those issues. As a result, Kramer’s films have come to represent a very safe and middlebrow version of 50s and early 60s style liberalism. Now, I have previously reviewed 4 Stanley Kramer films on this site and I have to admit that I was somewhat dismissive of most of them. I felt that Ship of Fools was shallow. I thought that Guess Who’s Coming To Dinner collapsed under the combined weight of a self-satisfied script and Kramer’s refusal to let Sidney Poitier’s character be anything other than idealized perfection. R.P.M. is a guilty pleasure, specifically because Kramer was so out-of-touch with the film’s subject matter. I did give Judgment at Nuremberg a good review, describing it as one of Kramer’s rare films that still holds up today. And now, I’m going to give another Kramer film a good review. Kramer’s 1958 film The Defiant Ones features a classic Kramer situation. White Joker (Tony Curtis) and black Noah (Sidney Poitier) are both prisoners in the deep south. Joker is an unrepentant and violent racist while Noah … well, Noah is Sidney Poitier. He’s determined, he’s not afraid to speak his mind, and most of all, he’s dignified. That’s not meant to be a complaint about Poitier’s performance in The Defiant Ones. In the role of Noah, Poitier has a great screen presence and it’s impossible not to root for him. Whereas Curtis tends to chew up every piece of scenery that he gets nears (and, again, that’s not really a complaint because Curtis’s overacting is totally appropriate for his character), Poitier keeps the film grounded. When the prison bus that is transporting them crashes, Joker and Noah are able to escape. Fleeing on foot, they make their way through the wilderness and attempt to hide from the police. As quickly becomes obvious, Joker and Noah hate each other but, because the sheriff had a sense of humor, they have also been chained together. In other words, they’re stuck with each other and, in order to survive, they’re going to have to learn to coexist. No, it’s not exactly subtle but it works. As a filmmaker, Kramer was never known for being visually inventive and, as a result, his films often had to resort to heavy-handed monologues to make their point. But, in The Defiant Ones, the chains act as a great visual symbol for race relations in America. Joker and Noah literally can’t escape from each other and they have to work together if they’re going to survive. The chains make that obvious and, as a result, this is the rare Kramer film where nobody has to give a big speech to get across Kramer’s message. As a result, The Defiant Ones preaches without ever getting preachy. Though the film is dominated by Poitier and Curtis, it also features some excellent supporting work. Lon Chaney, Jr, for instance, has a great cameo as world-weary man who helps the two convicts in their flight. Cara Williams is surprisingly poignant as a lonely, unnamed woman who tries to both protect Joker and get rid of Noah. And finally, there’s Theodore Bikel, playing the role of Sheriff Max Muller. Max is the most surprising character in the film, the head of a posse that’s set out to recapture Noah and Joker. As opposed to most of his men, Max is a humane and caring man who struggles to control the more bloodthirsty men who are serving under him. Message films tend to get dated rather quickly but The Defiant Ones holds up surprisingly well. 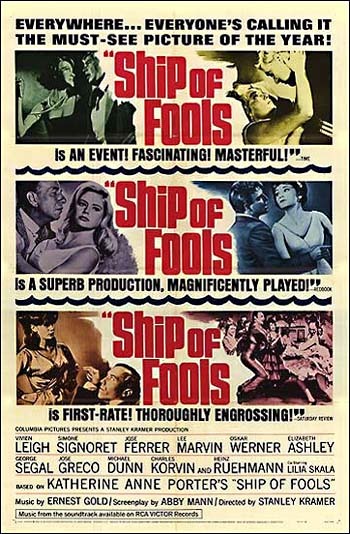 The 1965 best picture nominee Ship of Fools follows a group of passengers as they take a cruise. The year is 1933 and the luxury liner, which has just left Mexico, is heading for Nazi Germany. Both the passengers and the crew represent a microcosm of a world that doesn’t realize it’s on the verge of war. There’s Carl Glocken (played by Michael Dunn), a dwarf who has the ability to break the fourth wall and talk directly to the audience about all of the fools that have found themselves on this ship. He alone seems to understand what the future holds. There’s Mary Treadwell (Vivien Leigh), an aging Southern belle who spends almost the entire cruise flirting with the crew and other passengers, desperate to recapture her fading youth. That also seems to be the main goal of Bill Tenney (Lee Marvin), an unsophisticated former baseball player who spends most of the cruise brooding about his failed career. There’s the Countess (Simone Signoret), a political prisoner who is being transported to an island prison. She falls in love with the ship’s doctor (Oskar Werner). The doctor’s dueling scar suggests that he is a member of the old aristocracy and he is literally the film’s only good German. Perhaps not surprisingly, he is also in the process of dying from a heart condition. And then there’s David (George Segal) and his girlfriend Jenny (Elizabeth Ashley). David is a frustrated and depressed painter while Jenny is far more determined to enjoy life, which should be pretty easy because the boat is also full of performers and dancers. Finally, there’s the buffoonish Rieber (Jose Ferrer), a German industrialist whose dinner table talk hints at the horrors that are soon to come. Ship of Fools is a big, long film in which a large cast of stars deal with big issues in the safest way possible. In short, it’s a Stanley Kramer film. As one can tell from watching some of the other films that he directed (Judgment at Nuremberg, Guess Who’s Coming To Dinner, and R.P.M. ), Stanley Kramer made films that were often easier to admire than to actually enjoy. As the critic Mark Harris points out in his book Pictures At A Revolution, Kramer started out as a producer and he retained the sensibility of a producer even after he stared directing. As such, his films would address issues that were certain to generate a lot of free publicity but, at the same time, he would never run the risk of alienating his audience by digging too deeply into those issues. His films would have the type of all-star casts that would, again, bring in an audience but Kramer rarely seemed to give thought as to whether or not an all-star cast would distract from the film’s message. Finally, unlike the truly great directors, Kramer never really figured out how to tell a story with images. As a result, his movies were often full of characters whose sole purpose was to explain the film’s themes. Does that mean that Stanley Kramer never made a good film? No, not at all. Judgment at Nuremberg remains powerful and R.P.M. is a guilty pleasure of mine. Kramer was usually smart enough to work with talented professionals and, as a result, his films were rarely truly bad. Some of them even have isolated moments of greatness. It’s just that his films were rarely memorable and truly innovative and, therefore, they are easy for us to dismiss, especially when compared to some of the other films that were being made at the same time. With all that in mind and for reasons both good and bad, Ship of Fools is perhaps the most Stanley-Kramerish of all the Stanley Kramer films that I’ve seen. The film was apparently quite acclaimed and popular when it was originally released in 1965 but watched today, it’s an occasionally watchable relic of a bygone age. How you react to Ship of Fools today will probably depend on whether or not you’re an admirer of any of the actors in large cast. For the most part, all of them do a good job though you can tell that, as a director, Kramer struggled with how to make their multiple storylines flow naturally into an overall theme. 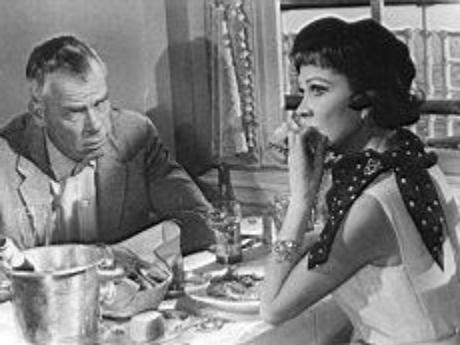 Not surprisingly, Vivien Leigh and Lee Marvin give the two most entertaining performances and Jose Ferrer makes for a wonderfully hissable villain. Oddly enough, I find myself most responding to the characters played by George Segal and Elizabeth Ashley. I’m not sure why — their storyline is rather predictable. Maybe it was just because Elizabeth Ashley’s character goes wild and starts dancing at one point. That’s what I would do if I found myself stuck on a boat with a tortured painted. In the end, Ship of Fools is a movie that will be best appreciated by those of us who enjoy watching old movies on TCM and take a special delight in spotting all of the wonderful actors that, though they may no longer be with us, have at least had their talent preserved on film. Ship of Fools may not be a great film but it does feature Vivien Leigh doing an impromptu and joyful solo dance in a hallway and how can you not appreciate that? I previously posted a review of the 1967 best picture nominee Guess Who’s Coming To Dinner that was somewhat critical of Stanley Kramer as a filmmaker. In retrospect, I feel like I may have been a bit too dismissive of Stanley Kramer. When one looks over the list of every film that has ever been nominated for best picture, one comes across the name Stanley Kramer (as a producer, a director, or both) far too many times to just blindly dismiss him for the sin of being old-fashioned. While Kramer made his share of well-intentioned misfires like Guess Who’s Coming To Dinner, he was also responsible for some films that remain important and watchable today. Judgment at Nuremberg is one of those films. Judgment at Nuremberg opens in 1947, with one car being driven through the ruins of Nuremberg, Germany. Inside the car is Dan Haywood (Spencer Tracy), a judge from Maine who has been appointed chief of a military tribunal that will be passing judgment on four German judges who are accused of crimes against humanity for their legal rulings during the Nazi regime. As Haywood quickly learns, many people don’t feel that the Nazi judges should be held as accountable for their actions as men like Hitler, Goebbles, and Goering should have been. It’s up to Haywood to determine whether the accused were simply doing their job or if they had a responsibility to defy the laws that they had sworn to uphold. Judgment at Nuremberg almost feels like two films. The first film is a courtroom drama, where the Nazi judges (the main one of which is played by Burt Lancaster) are prosecuted by the fiery Col. Tad Lawson (Richard Widmark) and defended by the idealistic Hans Rolfe (Maximilian Schell). While Lawson approaches the case and regards the defendants with righteous anger, Rolfe takes a more cerebral approach to defending the undefensible. Rolfe argues that the judges were following the laws of Germany and that if the tribunal finds them guilty than it will be finding the entire nation of Germany guilty. (In a rather clever twist, director Kramer and screenwriter Abby Mann initially make the German defense attorney a far more likable character than the American prosecutor.) During the trial, we also hear heart-wrenching testimony from two people (played by Montgomery Clift and Judy Garland) who were victimized by the Nazi regime and the judges who gave legal legitimacy to the regime’s crimes. The second film deals with Haywood adjusting to working in Germany and trying to understand how the Nazis could have come to power in the first place. Haywood asks several Germans to tell him about life under the Nazis and every time, he is met with bland excuses. (“We were not political,” he is told more than once.) The film’s strongest scenes are the ones where Haywood simply walks alone through the ruins of Nuremberg. Spencer Tracy was a uniquely American actor and, much as he did in Guess Who’s Coming To Dinner, Tracy here stood in for every American who was struggling to make sense of a changing world. In his book Pictures At A Revolution, Mark Harris correctly points out that Stanley Kramer started out as a producer and, even after he started directing, he still approached filmmaking like a producer. While that approach led to many uninspiring films, it was also the right approach for Judgment at Nuremberg. Perhaps realizing that Judgment at Nuremberg was a long and talky movie about a disturbing subject manner, Kramer made the very producer-like decision to fill Judgment at Nuremberg with recognizable faces. While this approach has proven disastrous for many films, it works quite well in Judgment at Nuremberg. This is one of the most perfectly cast films of all time, with all of the actors bringing both their characters and the issues that they’re confronting to vivid life. As the main defendant, Burt Lancaster brings a combination of intelligence and self-loathing to his role, playing him in such a way to reveal that even he can’t believe the evil he upheld as a judge. Meanwhile, Spencer Tracy is perfectly cast as a world-weary man who is simply trying to figure out what justice means in the post-war world. Maximilian Schell plays his role with so much passion that it’s impossible not to listen to him even when you despise the argument he’s making. Marlene Dietrich has an extended cameo where she plays the widow of Nazi general who befriends Judge Haywood but still refuses to admit that she knew anything about what Adolf Hitler was doing. Even William Shatner shows up, playing a small role as Haywood’s chief military aide and yes, he does deliver his lines in that Shatner way of his. First released in 1962, Judgment at Nuremberg won Oscars for Best Actor (Maximilian Schell) and Best Adapted Screenplay (Abby Mann) and was nominated for 9 more: Best Picture, Best Director, Best Actor (Spencer Tracy), Best Supporting Actor (Montgomery Clift), Best Supporting Actress (Judy Garland), Best Black-and-White Art Direction, Best Black-and-White Cinematography, Best Black-and-White Costume Design, and Best Film Editing. While it’s hard to argue with the victory of West Side Story in that year’s Oscar race, Judgment at Nuremberg remains a watchable and thought-provoking film. Sometimes, you just had to be there. That was my reaction as I watched the 1967 Best Picture nominee Guess Who’s Coming To Dinner. While this film may have been topical and even controversial when it was first released, when watched today it seems to be rather mild and tame. In Guess Who’s Coming To Dinner, Spencer Tracy plays Matt Drayton. Matt’s a San Francisco newspaper publisher, a respected member of the upper class establishment. His wife, Christina (Katharine Hepburn), owns a trendy art gallery and Matt spends his spare time playing golf with Monsignor Ryan (Cecil Kellaway). He’s the father of the free-spirited Joey (Katharine Houghton, who was Hepburn’s niece in real life). He’s also, as we’re told repeatedly by every other character in the film, a liberal who supports the civil rights movement. As the film begins, Joey is returning from a vacation in Hawaii and she has big news. While in Hawaii, she met and fell in love with the widowed John Prentice, a highly succesful doctor who is literally on the verge of winning a Nobel Peace Prize. Though he’s 16 years older than her and they’ve only known each other for 10 days, Joey and Prentice are planning on getting married. While Joey thinks that she’s bringing Prentice to San Francisco just so her parents can meet their future son-in-law, Prentice has specifically come to ask Matt’s permission to marry Joey. As Prentice explains to Matt, he’ll call the marriage off if Matt doesn’t approve. John Prentice, by the way, is played by Sidney Poitier and that is the source of the film’s conflict. Will Matt give his daughter permission to marry a polite, considerate, wealthy, saintly, world-renowned doctor despite the fact that he happens to be black? Watching Guess Who’s Coming To Dinner was a bit of a culture shock to me, both because I’m the result of an interracial marriage myself (my mom was Spanish and my dad’s white) and because several of my friends are either in or have been a part of an interracial relationship or marriage. For people my age, it’s not a big deal. We take it for granted that if you find someone to be attractive, you can have a relationship with him regardless of whatever race he may happen to be. While I was doing research on Guess Who’s Coming To Dinner, I was reminded that this wasn’t always the case. When Guess Who’s Coming To Dinner was first released in 1967, interracial marriage was still illegal in 17 states. In that same year, U.S. Secretary of State Dean Rusk offered to resign when his daughter married a black man. When Guess Who’s Coming To Dinner was first released, interracial marriage still a controversial subject and when Spencer Tracy struggled with his feelings about it, he stood in for countless Americans who, though they may have taken pride in how tolerant they were, still weren’t sure what they would do if a black man tried to join their family. In his excellent look at the 1967 nominees for best picture, Pictures At A Revolution: Five Movies And The Birth of The New Hollywood, Mark Harris provides a fascinating behind-the-scenes look at the filming of Guess Who’s Coming To Dinner. Harris quotes Kramer as explaining that the character of John Prentice had to be perfect because, if the character had any flaws, then bigots in the audience would have seized on those flaws as the reason why Prentice and Joey should not be allowed to marry. As Kramer explains it, the entire film was set up to make it clear that the only possible reason that Matt could have to object to Prentice would be the color of his skin. To an extent, I can see Kramer’s point (and again, it’s hard to judge what was necessary to make a point in 1967 from the perspective of 2013) but, as I watched Guess Who’s Coming To Dinner, it was hard not to feel that the main problem with the film was that Prentice was just too perfect. Certainly, he was too perfect to be in love with Joey who, as played by Houghton, simply seemed to be too naive and foolish to be a good match for a man who is on the verge of winning a Nobel Prize. Even more importantly, it’s hard to escape the fact that this accomplished, confident black man still needs to get the permission of a well-meaning white liberal before he can marry the woman he claims to love. Ultimately, despite the film’s noble intentions, it feels more than a bit condescending. At no point is Prentice allowed to show any anger or frustration at having to prove himself. There’s even a scene where Prentice criticizes his own father for being too hung up on racism. “Not until you and you’re whole lousy generation lay down and die will the weight of you be off our backs … You think of yourself as a colored man … I think of myself as a man!” Prentice tells him, as if his success was due to ignoring racism as opposed to defying it. If Guess Who’s Coming To Dinner has dated badly as a look at race relations in the United States, it remains watchable because of the performances of Katharine Hepburn and Spencer Tracy. This was their 9th and final film together and the love that these two accomplished actors felt for each other shines through every scene. Tracy was seriously ill while making the film (and died before it was released) but he gave one of his best and most heartfelt performances here. He was nominated for a posthumous Oscar but lost to Rod Steiger, who co-starred with Poitier in the film that beat Guess Who’s Coming To Dinner for best picture, In The Heat of the Night. In the Heat of the Night is best-remembered for the scene in which Poitier angrily declares, “They call me …. MISTER TIBBS!” This line epitomized the righteous anger that he was not allowed to display in Guess Who’s Coming To Dinner. If only Guess Who’s Coming To Dinner had its own “MISTER TIBBS” moment, it might be remembered as something other than a film that seems curiously out-of-place as a nominee for best picture. * That said, Kramer’s post-Guess films were actually pretty interesting and a bit more daring. Some day, I’ll have to get around to reviewing his 1970 campus unrest film, R.P.M.